The global radiofrequency-based devices market for lower back pain is a multi-million market, which is majorly controlled by some of the leading players of the medical device industry. Radiofrequency ablation is one of the prominent pain management procedures incorporated for lower back pain management. The procedure involves the use of radiofrequency alternating current to ablate the specific nerve responsible for transmitting pain signals to the brain. The rising prevalence of lower back pain and stringent regulations abiding the use of opioid are the pivotal factors propelling the growth of global radiofrequency-based devices market for lower back pain. The lower back pain management procedure based on radiofrequency is known as Radio Frequency Ablation (RFA) which is a minimally invasive procedure and provides an expeditious relief from pain associated with chronic diseases. The procedure has several benefits such as low risk of side effects, short recovery period, and reduced post-procedure complications, among others. Different instruments involved in radiofrequency ablation procedure include radiofrequency generator, electrodes, probes, needles, cannulae, and several other accessories such as ground pads, foot switch, and elongation cables, among others. The technological developments in interventional pain management procedures and breakthroughs in neural anatomy have resulted into the emergence of pain management procedures based on thermal ablation. The specificity and ability of radiofrequency alternating current to treat chronic pain with minimal or no tissue damage has resulted in the massive-scale adoption of pain management procedures based on radiofrequency. The purpose of this study is to gain a holistic view of the global radiofrequency-based devices market for lower back pain in terms of various influencing factors, such as recent trends, regulatory requirements, and technological advancements of the market. The market has been segmented into ‘product’, ‘end users’, and ‘region’. The report also evaluates the opportunities in the market for stakeholders and provides details of the competitive landscape for market leaders. Moreover, the report also includes the exhaustive information on the unmet needs, perception on the new products, consumer preferences, competitive landscape, restraints and opportunities, and other vital information with respect to radiofrequency-based devices for lower back pain. Further, the report also presents a detailed analysis of the market dynamics, consumers’ perception, pricing trends, and the estimation of the market size over the forecast period 2018-2026. The report presents the reader with an opportunity to unlock comprehensive insights with respect to the market and helps in forming well-informed strategic decisions. The research uncovers some of the substantial parameters that must be taken into consideration before entering the market. 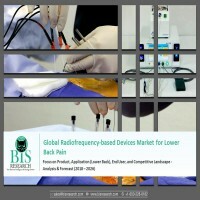 This research report aims at answering various aspects of the global radiofrequency-based devices market for lower back pain with the help of the key factors driving the market, restraints and challenges that can possibly inhibit the overall market growth, and the current growth opportunities that are going to shape the future trajectory of the market expansion. The report includes an in-depth examination of the key players and recent developments taking place in this market. Moreover, the report includes chapters on market dynamics (market drivers, opportunities, and challenges) and industry analysis as well. • How did radiofrequency ablation technology evolve, and what is its scope in future? • What are the key developmental strategies that are being implemented by the key players to sustain in this market? • What are the regulations abiding radiofrequency-based devices for lower back pain management in different regions namely North America, Europe, Asia-Pacific, Latin America, and Middle-East and North Africa (MENA)? • What are the major market drivers, challenges, and opportunities in the global radiofrequency-based devices market for lower back pain? • What are the consumers’ perceptions and their preference rates for radiofrequency-based pain management procedures in different regions namely North America, Europe, Asia-Pacific, and Middle-East and North Africa (MENA)? • What are the leading companies dominating the global radiofrequency-based devices market for lower back pain? • What is the future scope for expansion by the key players of the market in different regions namely North America, Europe, Asia-Pacific, Latin America, and Middle-East and North Africa (MENA)? • What is the scale of impact on market dynamics by the operations of key players of the market? • What is the best value chain model adopted by the leading players in the market? • What is the best supply chain model adopted by the leading players in the market? • What was the market value of the leading segments and sub-segments of the global radiofrequency-based devices market for lower back pain in 2017? • How will each segment of the global radiofrequency-based devices market for lower back pain grow during the forecast period, and what will be the revenue generated by each of the segments by the end of 2026? • How will the industry evolve during the forecast period 2018-2026? • Which geographical location will contribute to the highest sales of the radiofrequency-based devices for lower back pain management during the forecast period? • What is the scope of expansion in the emerging economies of Asia-Pacific and Latin America? • What are the consumers’ perceptions for different offerings of key players of the market? The key players who have been contributing significantly to the global radiofrequency-based devices market for lower back pain include Bramsys Indústria e Comércio Ltda, BVM Medical Limited, CONMED Corporation, Boston Scientific Corporation, Medtronic PLC, Diros Technology Inc., Epimed International, Halyard Health, Inc., joimax GmbH, Merit Medical Systems, Inc., RF Medical Co., Ltd., sfm Medical devices GmbH, Smith & Nephew plc, Abbott Laboratories, and Stryker Corporation, among others. 11.10 Merit Medical Systems, Inc.
11.11 RF Medical Co., Ltd. Figure 31 Basic Regulatory Requirements for Medical device Manufactured in the U.S. The annual societal costs for chronic pain in the European Union was valued $356.00 billion in 2013. Factors such as long hospital stays, increased number of rehospitalizations, high frequency of outpatient visits, and loss of work productivity due to high emotional distress, among others, are the leading contributors to the massive socioeconomic burden of chronic pain. According to World Health Organization (WHO), in 2013, four of the top ten leading causes of disability were chronic pain conditions namely, lower back pain, neck pain, migraine, and musculoskeletal disorders. Despite high economic burden, chronic pain also has several detrimental effects on the quality of patient lives and their respective families. Accompanied by the high risk of significant disability, chronic pain also leads to psychological disorders such as depression and anxiety. More than 30% of chronic pain affected population reported difficulty in handling routine tasks such as driving, sleeping, cleaning, participating in fitness activities, bathing, and participating in social activities, among others. Lower back pain is one of the most predominant types of chronic pain. The global incidence of lower back pain was 539 million in 2015. The severity of the lower back pain and several other detrimental effects have significantly elevated the requirement of cost-effective pain management procedures with reduced risk of mortality, increased efficiency of treatment resulting in long-lasting effect, and reduced risk of pain recurrence. The technological breakthroughs in neural anatomy and interventional pain management technologies have resulted into emergence of pain management procedures based on radiofrequency alternating current. The specificity and ability of radiofrequency alternating current to treat chronic pain with minimal or no tissue damage has resulted in significant adoption of pain management procedures based on radiofrequency. The global radiofrequency-based devices market for lower back pain has been witnessing a stable promising annual growth rate of approximately 6.24% from the past four years. Several key players have been making strenuous efforts to raise awareness for radiofrequency-based pain management devices and consequentially to boost the adoption rate. The purpose of the study is to gain a holistic view of the radiofrequency-based devices market for lower back pain in terms of various factors influencing it such as recent trends and technological advancements of the market. The scope of this report is centered upon conducting a detailed study of the devices allied with the radiofrequency-based pain management procedure, which includes generators, electrodes, probes, cannulae, and accessories. The global radiofrequency-based devices market for lower back pain is segmented into three different parts namely by product, by end user and by region. The global market value was estimated using these three different approaches and was validated with one another. These segments are further divided into several sub- segments to ease the market estimation and to gain a holistic view of the market. The global radiofrequency-based devices market for lower back pain is expected to reach $444.4 million by 2026. The growing prominence for the radiofrequency-based pain management procedures with improved efficiency and reduced risk of disease recurrence are bolstering the growth of the global radiofrequency-based devices market for lower back pain. The global radiofrequency-based devices market for lower back pain by product is currently dominated by the generators. The contribution of generators is anticipated to grow at a CAGR of 7.67%, during the forecast period 2018-2026. The significant demand for radiofrequency generators in the pharmaceutical and healthcare market aided by the increasing adoption rate of minimally invasive procedure for the treatment of chronic lower back pain, are the major factors contributing to the growth of the radiofrequency generators market. However, the market for cannulae is anticipated to witness the highest CAGR of 10.82% in the forecast period 2018-2026. By end-user, hospitals are the leading contributors to the global radiofrequency-based devices market for lower back pain in terms of revenue. The contribution of hospitals was valued $129.9 million in 2017. The global radiofrequency-based devices market for lower back pain is segmented into North America, Europe, Asia-Pacific, Latin America, Middle-East and North Africa, and Rest-of-the-World (RoW) regions. North America currently holds the largest market share in terms of revenue generation. However, the Europe radiofrequency-based devices market for lower back pain is anticipated to grow with the highest CAGR of 10.23% in the forecast period 2018-2026.